A couple nights ago, Terese and I went to a book reading/signing by our new favorite author, Laurie R. King. We are currently reading our way through her Mary Russell and Sherlock Holmes series but took the opportunity to see her as she was on a book tour promoting her new book, The Bones of Paris. What fun. Ms. King was a delightful speaker. Of course I snagged a copy while we were there, and I can't wait to dig in. 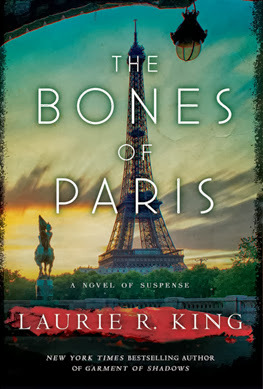 If you want to read more about the amazing amount of research Ms. King completed before writing her book, check out her Pinterest page for The Bones of Paris; and this interactive map of Paris in 1929. Oh baby oh, aren't you the looker?. Looks like there is a third eye on that pillow beside you, did you see it? I'm shopping for goggles for when I am in the car. There is too much airflow in a small space and it dries my eyes out so bad I'm in misery for days after being in the car. Maybe ski goggles? We live close enough to a hub for authors that we take it for granted. You can get books signed by authors at garage sales without having to go down there to meet them - again. Where do you get the energy? I'm reading the latest Tim Dorsey Serge Storms book, The Rip Tide Ultra-glide. The psychopath from Florida that kills for the common good with his mentally deficient stoner friend Coleman. It's something I can read while I write and watch T.V. My ribs are trying to heal from fractures and laughing is counter productive to mending bones. I am also a fan of Laurie King, especially her first. I forced my smart friend to sit down and read it and she was astonished at how much she enjoyed it. Serge Storms is new to me. I'll have to look. Right now I am reading Cae Histories by Kate Atkinson. It got great reviews.